RedwoodNational and State Parks on California’s northwest coast preserve the largest remaining contiguous section of ancient coast redwood forest, including some of the world’s tallest and oldest trees. Old-growth redwoods are immense, ancient, stately, mysterious, and powerful. From a seed no bigger than one from a tomato, California's coast redwood (Sequoia sempervirens) may grow to a height of 367 feet (112 m) and have a width of 22 feet (7 m) at its base. Imagine a 35-story skyscraper and you have an inkling of the trees' ability to arouse humility. The human footprint in this park dates back more than 4,500 years. The Tolowa, Yurok, Chilula and Hupa peoples continue to rely on the park for spiritual, cultural, physical and economic sustenance. The park’s landscape holds remnants of its past logging, ranching, fishing and military history. At Redwood, you can hike among the giants, relax in fields of wildflowers and explore the beaches of the Pacific coast. When redwood harvesting began in the early 1850s, over two million acres of old-growth redwood forests existed. But Euro-Americans took less than 60 years to reduce this number into hundreds-of-thousands of acres. Preservationist groups began purchasing large tracts of redwood acreage in an effort to save the quickly disappearing forests. Fossil records have shown that relatives of today's coast redwoods thrived in the Jurassic Era 160 million years ago. The redwoods continue to thrive in California's North Coast, the only place in the world with the right combination of longitude, climate, and elevation. The cool, moist air created by the Pacific Ocean keeps the trees continually damp, even during summer droughts. 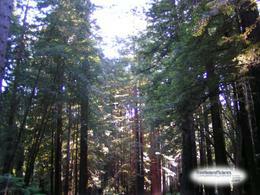 By the 1960s, 90 percent of the original redwoods had been logged. After much controversy and compromise with timber companies, Congress finally approved a federal park, and on October 2, 1968, President Lyndon B. Johnson signed into law the act that established the 58,000-acre Redwood National Park. The park’s primeval forests, prairies, rivers, coastline, and woodlands have been cooperatively managed by the National Park Service and the California Department of Parks and Recreation since 1994 and today form a World Heritage Site. Exactly why the redwoods grow so tall is a mystery. Resistance to natural enemies such as insects and fire are built-in features of a coast redwood. Diseases are virtually unknown and insect damage insignificant thanks to the high tannin content of the wood. Thick bark and foliage that rests high above the ground provides protection from all but the hottest fires.The trees can reach ages of 2,000 years and regularly reach 600 years. The coast redwood environment recycles naturally; because the 100-plus inches of annual rainfall leaves the soil with few nutrients, the trees rely on each other, living and dead, for their vital nutrients. The North Coast is often gray with a thick layer of fog, especially during summer,. When inland temperatures are high, the fog is drawn in from over the ocean. This natural cooling and moistening system is beneficial to the redwoods as fog accounts for about 40 percent of the redwoods' moisture intake. You can participate in ranger-led activities, scenic drives, walks, and hikes. Learn more about the trees, camping, and backcountry basics at any of five visitor centers. Whatever you do, you’ll marvel at all these majestic trees have survived while admiring their unequaled natural beauty.